On other news, Kadokawa announced the second and final novel based on the Kobato. TV Anime. The novel will be titled Kobato. #2 – Only One Wish (こばと。 2 たったひとつの願い) with release date set to July 15. Like the first installment, the novel will be written by Shiribuji Riu (後藤リウ) with illustrations by Madhouse. And last but not least, today marks 7 years since the first chapter of Tsubasa was published in Weekly Shonen Magazine, the series that would later become CLAMP’s best-selling work. 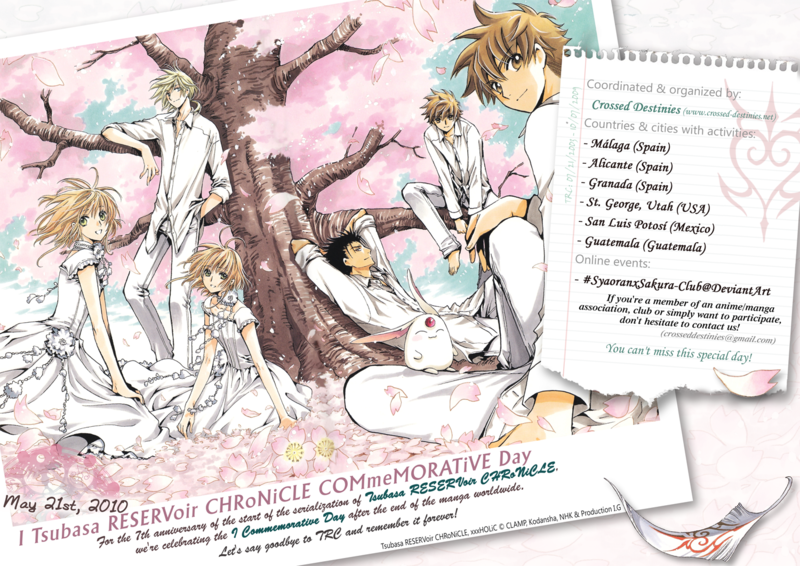 To celebrate the occasion, several events will be held in different cities around the world for the I Tsubasa RESERVoir CHRoNiCLE COMmeMORATiVE Day. Click here to see if your city is listed. Yeah, the promotion was massive. It seems pointless to do all this promotion for a short run. It really doesn’t look like it’s ending anytime soon. Oh cool, a promotion! I’m guessing the starting in June that for those who missed xxxHOLiC would buy the magazine (for sure). I celebrated this day with a few of my friends online, wrote a fanfiction, re-read a few manga chapters, and ate Halo-Halo as Festive Food ;). YA i love the promotions! ^_^ thanks chibi yuuto *HUGS* btw this is my first post… i have been a fan of yours and clamps for a while now but i never got around to post comment. thanks so much for the info and happy tsubasa day! ^_^ oi love trc ^_^ i wish i would have had time to make amv to celebrate but i didn’t have time due to finals but i did re-upload a vid… its not as great as some amvs but i tried… (i think i can do better now lol) anyways happy Tsubasa Chronicle commemorative day! Wow! This is the first time I’ve heard of a CM advertising a manga…and one about switching magazines at that too!